While waiting for the plumber to fix my garbage disposal, I've been keeping busy with blogging, editing photos, and reviewing my house to do list this year, which includes redoing the master bathroom that will definitely involve Tile floor installation. I should be outside since it is a three-day weekend, but I am not too happy with the cold weather here. Winter can be a drag and since arriving from Hawaii, this winter is becoming harder to handle. My heater has been blasting non-stop for weeks now. I'm worried about my electric bill this month. So while the temperature is dropping in the Maryland area, I keep myself warm by looking at photos of Hawaii. Sometimes, coats, thick socks and winter boots are not enough to keep me warm, but the memories of warm Hawaii can. Here are the photos I took when we visited Dole Plantation. You will be greeted by this building when you drive into the plantation. 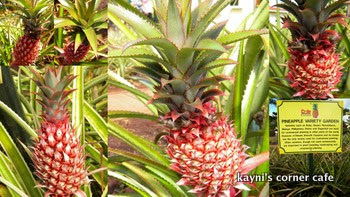 The Pineapple Garden Maze which I accomplished in 2006. Interesting sign post - it tells how far Hawaii is from other destinations. A perfect blend of tropical colors. Sample garden showing all the Pineapple varieties. A brief history of Dole, Hawaii and the Pineapple. The gift shop. There's also an ice cream shop at the back where they sell pineapple ice cream. look at how red the pineapples are! it's been cold here to kayni! talagang the climate is changing. I wonder how pineapple ice cream taste like? Hmmm. Have you tried one? oh kayni it is so cold here too! and thanks to your photos, i feel warm already! I really wish I could afford a HI vacation. That garden alone is worth a couple of hours of exploration. That exotic plant, is that a ginger lily? @ Daphne, The pineapple ice taste like ice cream and I like it. @ Photo Cache, I don't think it's a ginger lily but one reason why I took a photo is because I don't know the name and found it really pretty...lol.